Rosacea is a common disease that encompasses a broad range of symptoms. Rosacea usually begins in middle age and is characterized most commonly by flushing, facial redness, and visible blood vessels. Some forms of rosacea also cause red bumps, pimples, thickening of the skin, irregular growths on the face, and eye symptoms. The cause of rosacea is unknown. Proposed associations include bacterial colonization, sun damage, neurovascular disease, chemical exposures, and abnormal oil glands. The most common symptoms include facial redness - usually on the nose, cheeks, chin and forehead. Visible vessels (called telangiectasias), facial swelling and burning sensations are also found. Red bumps or pimples may be seen as well. Rosacea can develop gradually, as mild episodes of facial blushing. Over time, flushing may lead to a permanently red face. One form of rosacea, called ocular rosacea can affect the eyelid and the surface of the eye. Symptoms can include redness, dry eyes, burning and styes. How is the diagnosis of rosacea made? Dermatologists can usually diagnosis rosacea based on an interview and by examining your skin. There are different forms of rosacea which look different and are often treated differently. Because rosacea is a term that covers a range of symptoms, treatment options are quite extensive. You and your physician can find the right treatment/s for you. What over the counter treatments are available? Sun clearly aggravates rosacea and therefore, broad-spectrum (UVA/B) sunscreen is recommended. Sunscreens are included in some of the prescription medications discussed below. Cosmetic cover-ups with a green tint can cover the redness that is the hallmark of rosacea. Unfortunately, sunscreens can be irritating, especially in patients with rosacea. Sunscreens combined with certain moisturizers that contain silicones can counter irritation. Rosacea patients should avoid irritating chemicals in cosmetics such as soaps, astringents, toners, menthols, and camphors. What prescription creams are available? Three topical medications are FDA approved for the treatment of rosacea and are available in a wide number of commercially available formulations: metronidazole, sodium sulfacetamide/sulfur, and azelaic acid. Several other medications have been successfully used to treat rosacea and include benzoyl peroxide, erythromycin, clindamycin, tacrolimus, and tretinoin. Each medication has its own side effect profile but generally, the most common side effect is mild irritation. You and your physician will decide on the right treatment for you. What pills are used to treat rosacea? When rosacea is severe and/or does not respond to topical treatment, dermatologists will often use pills. The mainstays of therapy are the tetracyclines (including minocycline and doxycycline). Some patients can achieve a remission after a course of therapy but most need to stay on the pills to maintain the response. The pill form of macrolides (erythromycin, azithromycin) and metronidazole have also been shown to effectively treat rosacea. The vitamin A derivative, isotretinoin (also known as Accutane) may be effective for rosacea but is less commonly used. Each pill has its own set of side effects. The antibiotics are usually well tolerated but run the risk of antibiotic resistance. Isotretinoin has a long list of side effects, most of which are reversible once it is stopped. Only you and your physician can decide which treatment is right for you. Most of the so called “vascular” lasers used today are called “pulsed dye lasers” and specifically target the blood cells in dilated vessels. The blood cells in the vessel absorb the energy from the laser, which selectively destroys the blood vessel. Lasers are quite effective, especially for conditions such as rosacea. Usually one to three treatments are required, 4-8 weeks apart. Some of the lasers cause moderate pain during the procedure but minimal recovery is needed after treatment. The most common side effect- darkening of the treated area- occurs in less than 10% of patients and fades gradually. Cost ranges from $200 to $500 per treatment, depending on the size of the area treated. The risks and benefits of laser therapy need to be discussed in detail with your physician. 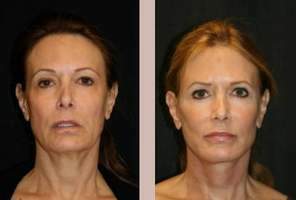 IPL is one of the newer forms of facial rejuvenation. Unlike lasers, which use intense, focused light, IPL is intense broadband light. Although IPL delivers energy to both the superficial and deep layers of the skin, the epidermis is spared from damage. Thus, there is virtually no recovery time. In the studies that have been performed so far, IPL can smooth the skin and fade age spots, freckles, melasma, and dilated blood vessels seen in rosacea. Improvements usually last for about a year with good sun protection. IPL is safer than laser therapy because IPL does not damage the epidermis. There may be some pain during the procedure but no recovery time. Unlike laser therapy, however, you may need multiple treatments (average is 4-6, at three weeks intervals) to get the full benefit. The cost is variable, but is usually more expensive than peels and less expensive than lasers (300-600 dollars per treatment). The risks and benefits of IPL therapy need to be discussed in detail with your physician.